The prince-archbishopric's territory was roughly congruent with the present-day Austrian state of Salzburg. It stretched along the Salzach river from the High Tauern range—Mt. Großvenediger at 3,666 m (12,028 ft)—at the main chain of the Alps in the south down to the Alpine foothills in the north. Here it also comprised the present-day Rupertiwinkel on the western shore of the Salzach, which today is part of Bavaria. The former archepiscopal lands are traditionally subdivided into five historic parts (Gaue): Flachgau with the Salzburg capital and Tennengau around Hallein are both located in the broad Salzach valley at the rim of the Northern Limestone Alps; the mountainous (Innergebirg) southern divisions are Pinzgau, Pongau around Bischofshofen, and southeastern Lungau beyond the Radstädter Tauern Pass. In the north and east, the prince-archbishopric bordered on the Duchy of Austria, a former Bavarian margraviate, which had become independent in 1156 and, raised to an archduchy in 1457, developed as the nucleus of the Habsburg Monarchy. The Salzkammergut border region, today a UNESCO World Heritage Site, as an important salt trade region was gradually seized by the mighty House of Habsburg and incorporated into the Upper Austrian lands. In the southeast, Salzburg adjoined the Duchy of Styria, also ruled by the Habsburg (arch-)dukes in personal union since 1192. By 1335, the Austrian regents had also acquired the old Duchy of Carinthia in the south, the Styrian and Carinthian territories were incorporated into Inner Austria in 1379. The Habsburg encirclement was nearly completed, when in 1363 the archdukes also attained the County of Tyrol in the west. Only in the northwest did Salzburg bordered on the Duchy of Bavaria (raised to an Electorate in 1623), and the tiny Berchtesgaden Provostry, which was able to retain its independence until the Mediatisation in 1803. The Vita Sancti Severini biography by the Early Christian chronicler Eugippius reported that during the Decline of the Roman Empire about 450 AD the local capital Iuvavum in the Noricum ripense province was already home to two churches and a monastery. Very little is known of the early bishopric during the Migration Period, and the legendary Saint Maximus of Salzburg is the only abbot-bishop known by name. A disciple of Saint Severinus, he was martyred in the retreat from Noricum, after the Germanic Western Roman officer Odoacer had deposed the last Emperor Romulus Augustulus and declared himself King of Italy in 476. In his conflict with the Rugii tribes, Odoacer had his brother Onoulphus evacuate the Noricum ripense province in 487/88, whereby Iuvavum was abandoned and with it the bishopric. Saint Severinus had already died in 482 in the castrum of Favianis (present-day Mautern in Lower Austria), six years before the departure of the Roman legions from the region. From the 6th century onwards, the northern areas of the later archbishopric were resettled by Germanic Bavarii tribes, who established themselves among the remaining Romance population, while Slavic tribes moved into the southern Pongau and Lungau parts. 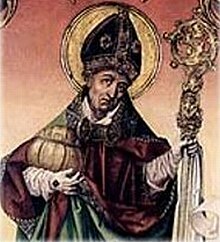 About 696 Saint Rupert, then Bishop of Worms in Frankish Austrasia and later called the apostle of Bavaria and Carinthia, came to the region from the Bavarian town Regensburg and laid the foundations for the re-establishment of the Salzburg diocese. After erecting a church at nearby Seekirchen he discovered the ruins of Iuvavum overgrown with brambles and remnants of the Romance population, who had maintained Christian traditions. The former theory that he arrived already in c. 543 during the time of the unsourced early Bavarian dukes appears less likely than that he worked during the reign of the Agilolfing duke Theodo II (c. 680–717), when the Bavarian stem duchy came under Frankish supremacy. In either case, it was not until after 700 that Christian civilisation re-emerged in the region. Arno, bishop since 785, enjoyed the respect of the Frankish king Charlemagne who assigned to him the missionary territory between the rivers Danube in the north, the Rába (Raab) in the east and the Drava in the south, an area which had recently been conquered from the Avars. Monasteries were founded and all of Carinthia was slowly Christianised. While Arno was in Rome attending to some of Charlemagne's business in 798, Pope Leo III appointed him Archbishop over the other bishops in Bavaria (Freising, Passau, Regensburg, and Säben). When the dispute over the ecclesiastical border between Salzburg and the Patriarchate of Aquileia broke out, Charlemagne declared the Drava to be the border. Arno also began the copying of 150 volumes from the court of Charlemagne, beginning the oldest library in Austria. Archbishop Adalwin (859–873) suffered great troubles when King Rastislav of Moravia attempted to remove his realm from the ecclesiastical influence of East Francia. In 870 Pope Adrian II appointed the "Apostle of the Slavs" St. Methodius the Archbishop of Pannonia and Moravia at Sirmium, entrusting him large territories under the overlordship of the Salzburg diocese. It was only when Rastislav and Methodius were captured by King Louis the German that Adalwin could adequately protest the invasion of his rights. [clarification needed] Methodius appeared at the Synod of Salzburg where he was struck in the face and imprisoned in close confinement for two and a half years. Adalwin attempted to legitimise his imprisonment, but was compelled to release Methodius when ordered by the Pope. Soon after, the Magyars ravaged Great Moravia and not a church was left standing in Pannonia. Archbishop Dietmar I fell in battle in 907. It was not until the Battle of Lechfeld in 955 that the Magyars suffered a crushing defeat, and ecclesiastical life in Salzburg returned to normal. The following year after Archbishop Herhold allied with Liudolf, Duke of Swabia and Duke Conrad the Red of Lorraine, he was deposed, imprisoned, blinded, and banished. Archbishop Bruno of Cologne, called the Bishop-Maker, appointed Frederick I archbishop and declared the Abbacy of St. Peter independent. In 996, Archbishop Hartwig received the right to mint money. In the era beginning with Pope Gregory VII, the Latin Christendom entered a period of internal conflict. The first archbishop of the era was Gebhard, who during the Investiture Controversy remained on the side of the Pope. [clarification needed] Gebhard thus suffered a nine-year exile, and was allowed to return shortly before his death and was buried in Admont. His successor Thimo was imprisoned for five years, and suffered a horrible death in 1102. After King Henry IV abdicated and Conrad I of Abensberg was elected Archbishop. Conrad lived in exile until the Calistine Concordat of 1122. Conrad spent the remaining years of his episcopate improving the religious life in the archdiocese. The Archbishops again took the side of the Pope during the strife between them and the Hohenstaufens. Archbishop Eberard I of Hilpolstein-Biburg was allowed to reign in peace, but his successor Conrad II of Austria earned the Emperor's wrath and died in 1168 in Admont a fugitive. Conrad III of Wittelsbach was appointed the Archbishop of Salzburg in 1177 at the Treaty of Venice, after the partisans of both Pope and Emperor were deposed. Coat of arms of Hieronymus von Colloredo as Prince-Archbishop of Salzburg, incorporating elements of princely and ecclesiastical heraldry. Archbishop Eberhard II of Regensberg was made a prince of the Empire in 1213, and created three new sees: Chiemsee (1216), Seckau (1218) and Lavant (1225). In 1241 at the Council of Regensburg he denounced Pope Gregory IX as "that man of perdition, whom they call Antichrist, who in his extravagant boasting says, I am God, I cannot err." Eberhard was excommunicated in 1245 after refusing to publish a decree deposing the emperor and died suddenly the next year. During the German Interregnum, Salzburg also suffered confusion. Philip of Spanheim, heir to the Dukedom of Carinthia, refused to take priestly consecrations, and was replaced by Ulrich, Bishop of Seckau. Conditions were at their worst during the reign of Bernard II of Rohr. The country was in depression, local authorities were raising their own taxes and the Turks were ravaging the archdiocese. In 1473, he summoned the first provincial diet in the history of the archbishopric, and eventually abdicated. [clarification needed] It was only Leonard of Keutschach (reigned 1495–1519) who reversed the situation. He had all the burgomasters and town councillors (who were levying unfair taxes) arrested simultaneously and imprisoned in the castle. [clarification needed] His last years were spent in bitter struggle against Matthäus Lang of Wellenburg, Bishop of Gurk, who succeeded him in 1519. Matthäus Lang was largely unnoticed in official circles, although his influence was felt throughout the archbishopric. He brought in Saxon miners, which brought with them Protestant books and teachings. He then attempted to keep the populace Catholic, and during the Latin War was besieged in the Hohen-Salzburg, declared a "monster" by Martin Luther, and two later uprisings by the peasants lead to suffering to the entire archdiocese. Later bishops were wiser in the ruling and spared Salzburg the religious wars and devastation seen elsewhere in Germany. 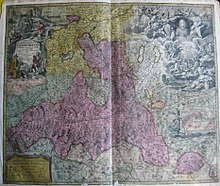 [clarification needed] Archbishop Wolf Dietrich von Raitenau gave the Protestants the choice of converting to Catholicism or leaving Salzburg. The Cathedral was rebuilt in such splendour that it was unrivalled by all others north of the Alps. Archbishop Paris of Lodron led Salzburg to peace and prosperity during the Thirty Years' War in which the rest of Germany was thoroughly devastated. During the reign of Leopold Anthony of Firmian, the remaining Protestants in Salzburg were expelled in 1731. He invited the Jesuits to Salzburg and asked for help from the emperor, and finally ordered the Protestants to recant their beliefs or emigrate. Over 20,000 Salzburg Protestants were forced to leave their homes, most of whom accepted an offer of land by King Frederick William I of Prussia. In 1803, Salzburg was secularised as the Electorate of Salzburg for the former Grand Duke Ferdinand III of Tuscany (brother of Emperor Francis II), who had lost his throne. In 1805 it became part of Austria, and in 1809 of Bavaria, which closed the University of Salzburg, banned monasteries from accepting novices, and banned pilgrimages and processions. The archdiocese was reestablished as the Roman Catholic Archdiocese of Salzburg in 1818 without temporal power. 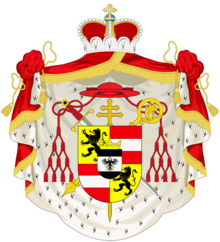 Up to today, the Archbishop of Salzburg has also borne the title Primas Germaniae ("First [Bishop] of Germany"). The powers of this title – non-jurisdictional – are limited to being the Pope's first correspondent in the German-speaking world, but had once included the right to preside over the Princes of the Holy Roman Empire. The Archbishop also has the title of Legatus Natus ("born legate") to the Pope, which, although not a cardinal, gives the Archbishop the privilege of wearing red vesture (which is much deeper than a cardinal's scarlet), even in Rome. St. Maximus of Salzburg, died 476. St. Ruprecht, born c. 543 or c. 698 – c. 718. See Roman Catholic Archdiocese of Salzburg for archbishops since 1812. ^ Christopher Clark, Iron Kingdom: The Rise and Downfall of Prussia, 1600-1947. Cambridge: Harvard University Press, 2006. pp. 141-143. Wikimedia Commons has media related to Maps of Catholic dioceses of Austria. Salzburg at the Catholic Encyclopædia. Legate at the Catholic Encyclopædia.